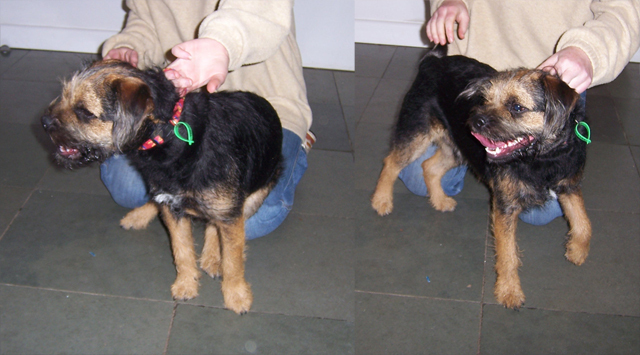 I was re-aquatinted with "Bolly", the pup from my photos, the other day at 9 months old. He is doing great. Excuse the nasty photos, but they do show that his legs are now correct and he stands up all by himself, now! with the sling on the back of the chair, how long do you leave the pup in for? or how often, or do u completely leave them in it between feeds. I left mine in there between feeds for the first day, and as she got better would lessen the time and give them some time to use their legs. I have a singleton baby and he has now turned into a swimmer grrrrrrrr...I have only ever had one swimmer and it wasnt a great outcome. This little guy is sooo important to my lines that it is super freaking me out. Please explain to me BB or Sway how the pillowcase works...my guy is hanging in one now, but he is sort of standing in the "corner" and end...I cant get him to lie on his side in it...he wasnt very happy. Please someone see this and reply. Cheers. Thanks BB...dont know if you noticed I have a cold and after chatting I have no voice left lol...bubby is on his side drinking now....thankyou for all the advice. Good news. LOL I did think your voice was a bit croaky. Turn the pillow case inside out. The part that you fold over to hold the pillow in, goes over the back of the chair to hang it. ps...on BB's suggestion I am looking for a net bag tommorrow. Mine was never on her side, legs always under. I guess weight of the puppy would also help, to hold a puppy in place. Could you safety pin the corners up and make it more of a rounded bottom then straight, that way there would be no corners to fall into. At Bunnings you can buy lengths of sticky flooring stuff that is intended to go under rugs in hallways etc to stop them slipping. It comes in green and bone colours. It's sort of rubbery feeling. I swear by this stuff for in the whelping box for swimmers. Their legs just can't slip out on it - their little pads stick to it. It's cheap - buy a few sheets to fit in the box and hose them off when they get dirty. Well day 2 in the pillowcase sling...he is on his side sometimes and others curled in a ball, which he couldnt do before. And now when he is put in the whelping box for feeds he zooms with his back legs, as good as one can zoom on egg cartons, to get to mum. He stays on his side the whole feed. So well on the way to getting better...he actually uses his legs instead of them being limp apendages hanging out the back end. Fantastic news Shazza. Sure works a treat. HE CAN WALK NOW Thanks for helping/saving my puppy.